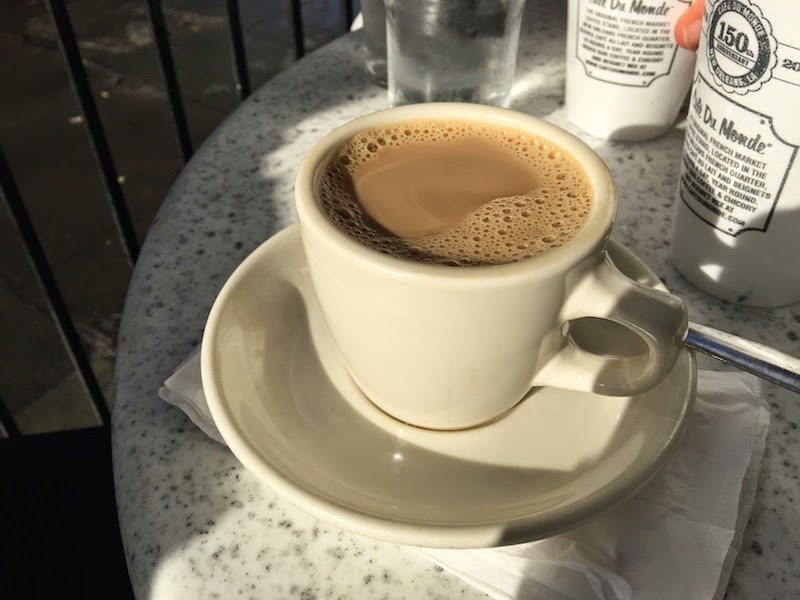 This is my first time in New Orleans and the Cafe Du Monde seems like a must-do for the first-time visitor to the French Quarter. 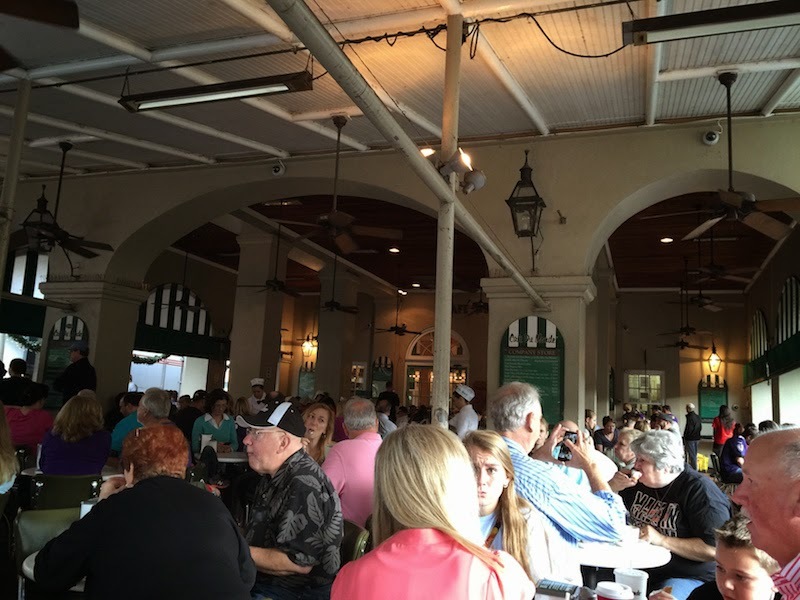 So yesterday morning we took the streetcar to the French Quarter and walked down to Cafe Du Monde. We got there early and sat right down at a table. Turns out we got lucky because within a few minutes the line was already down the block. We also got lucky with the clear and warm weather. There are some indoor tables but mostly there is a large outdoor covered patio with small tables. You seat yourself and after 10 or 15 minutes a waiter comes up for your order. There's not a lot of choices: orange juice, coffee, and beignets. 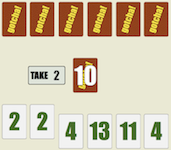 Ahh, the coffee! This is strong coffee with chicory which you can get plain or with milk (cafe au lait). Even with the milk, the coffee is still sort of strong. 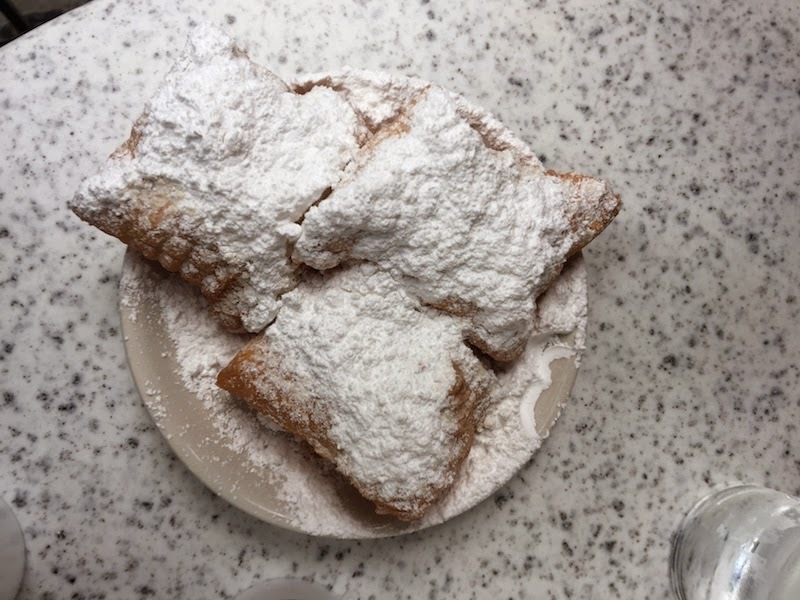 Just the thing to wake you up and get you ready for your day in the French Quarter. And the beignets! They are brought to your table almost as soon as they are made, and they arrive very hot with piles of powdered sugar. In fact you can't eat one of these without blowing the sugar all over yourself or perhaps your friends. They are warm and fluffy and delicious. 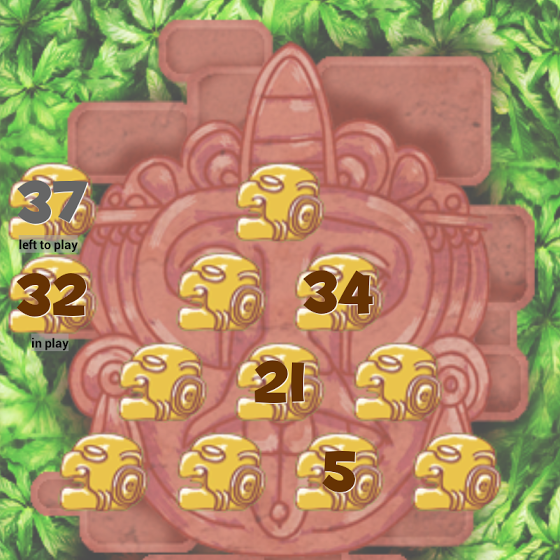 You get three to an order. After your snack you can wander around the side and watch how the beignets are made, and where the waiters line up to pick them up. 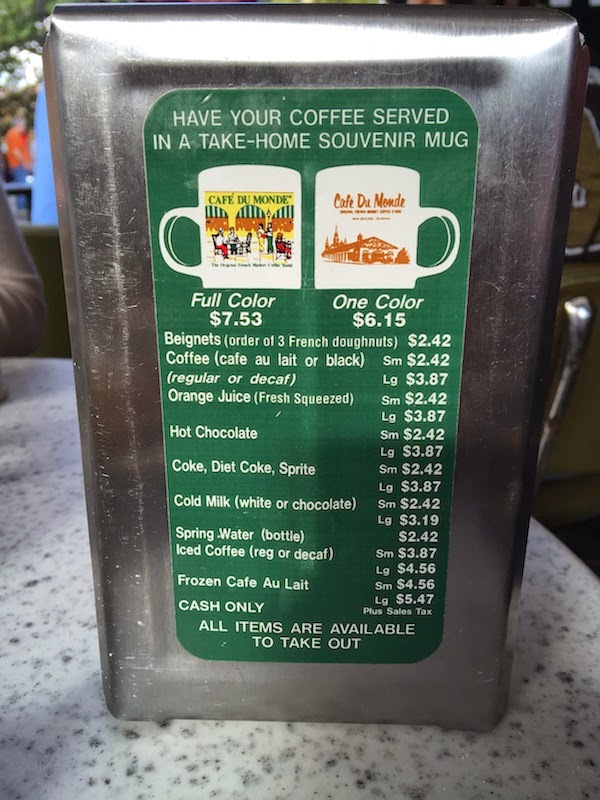 It's cash only at the Cafe Du Monde. I'm glad I made the visit, especially since we got there early and missed the wait in line. I'm not sure I would have enjoyed my sugary treat and strong coffee as much after standing in a long line. The gift shop is across the street where you can get the chicory coffee, beignet mix, t-shirts and a lot more. The prices are very reasonable; you can get a t-shirt for ten bucks. We picked up one, a couple of cans of coffee, and some drink mixes. 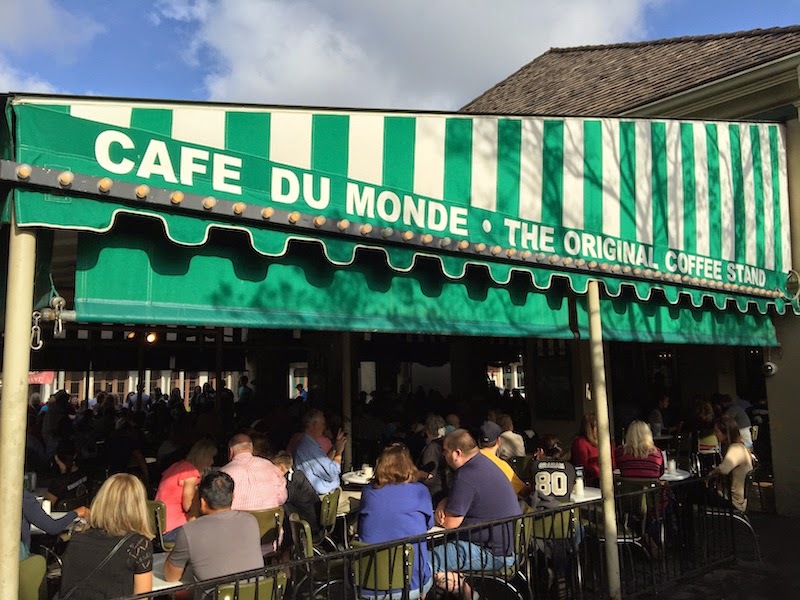 Cafe Du Monde has been featured on many travel shows, including Man Vs. Food and Food Paradise. The food show where I saw it was The Originals with Emeril Lagasse on the Cooking Channel.